"I first met her in the summer of 1997, when I stayed at the Shriver home in Hyannisport, Massachusetts, interviewing her husband. After I'd spent my first full day taping conversations with Sarge, discussing his service in World War II and his role as director of Lyndon Johnson's War on Poverty, she took me aside and asked me coldly and directly if I could be trusted. She clearly didn't like the idea of a writer she didn't know skulking around the premises. Not knowing how else to respond, I said I could be trusted. She didn't look convinced. The more I learned about her, the more of an honor it felt to have been traumatized by her relentless perfectionism. Her husband, her kids, her brothers-all of them had at one time or another been terrorized, and improved, by her. One day in the mid-1960s, Bobby Kennedy was scheduled to spend a day taping television advertisements with Democratic Senators and Congressmen running for re-election. He had taped spots with a few of the Congressmen, but had many more still to do when an aide reported that Eunice wanted to meet with him, and was calling repeatedly. Bobby started packing up to go. The aide was aghast-was Bobby really going to blow off a passel of Congressmen? "Look," Bobby said, "Who do you think it's worse to keep waiting: a bunch of Congressmen? Or my sister?" She could be difficult, and she could be fearsome; though I grew fond of her, and she stopped actively making my life miserable, she never stopped terrifying me. She was, quite simply, the most formidable woman I have ever met. Her legacy is profound and inspiring." Scott Stosel is the authorized biographer of Founding Peace Corps Director Sargent Shriver. 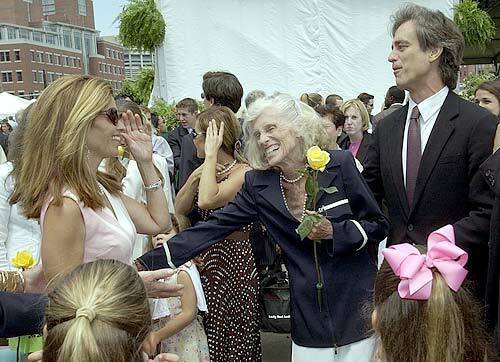 Eunice Kennedy Shriver terrified me. In fact for many months in the summer and fall of 2003, it's fair to say, she was the bane of my existence. Every time her number came up on my caller ID, I'd cringe. I'd answer the phone, and she'd start right in, without so much as a hello. "Eunice Shriver," she'd say, announcing herself, and then continue without pausing, "On the third page of chapter six, you've got it all wrong about Daddy." Sometimes she wouldn't even announce herself: "You still haven't changed that bit about the mentally handicapped and Head Start," she'd say, and then launch into a litany of other offenses I'd allegedly committed against her family or against history. I was in the final stages of writing and revising a biography of her husband, Sargent Shriver, and she had inserted herself quite forcefully into the process. I believe the biography gave a full picture of Sarge Shriver-it captured the positive and the negative about him-but on balance it presents the man as an American hero and an underappreciated mover of history; I believe Sarge to be a great and good man, and I think the book conveys that. But for Eunice, no detail was too small to quibble and obsess over, especially if it pertained to the Kennedy family. I spent many hours over many days in her office at the Kennedy Foundation in Washington, dickering over portrayals of this program or that person. "I don't think Bobby ever did that," she'd say about something her brother Robert Kennedy had done to her husband. I'd cite my sources, and explain why I put things the way I did. "I don't think so," she'd insist, in contravention of the facts. We'd go over a chapter and I'd think she was done with it and I'd fly back home to Boston. And then a week later I'd be summoned back to Washington to go over the same chapter again. Throughout all this, I tried to maintain a steadfast stance of "I'll take all this under advisement." But sometimes if she felt I was being too resistant to her point of view she would hint ominously that she would have my publishing contract canceled. I didn't know whether she had the power to do this, but I was afraid she might. Once, when I was doing research in the files of the Kennedy Foundation, I saw a large stack of what looked like book manuscripts piled on a shelf. I asked the Foundation archivist what they were and her response was chilling: "Those are histories of the Kennedy Foundation, or of Special Olympics, that Mrs. Shriver commissioned and then cancelled." Of course, Eunice had good reason to be skeptical of journalists. Decades of coverage of her family-some of it accurate and merited, much of it scurrilous and reprehensible-had made her wary. I first met her in the summer of 1997, when I stayed at the Shriver home in Hyannisport, Massachusetts, interviewing her husband. After I'd spent my first full day taping conversations with Sarge, discussing his service in World War II and his role as director of Lyndon Johnson's War on Poverty, she took me aside and asked me coldly and directly if I could be trusted. She clearly didn't like the idea of a writer she didn't know skulking around the premises. Not knowing how else to respond, I said I could be trusted. She didn't look convinced. But over the course of that summer, she grew warmer toward me. And while my initial fear of her never dissipated, my respect and admiration for her grew and grew, eventually coalescing into something like awe. Partly this was because of what I was learning about her through my research: the many medical ailments she had endured and overcome (when she was young her chronic stomach trouble had emaciated her and led her family to call her "punie Eunie"); her early work on juvenile delinquency; her political acumen ("if that girl had been born with balls," her father once memorably told a friend, "she would have been one hell of a politician"); her mother-bear-like protectiveness of her family; and of course her nearly single-handed role in literally revolutionizing the way the world sees the mentally handicapped. But partly my awe and respect derived from what I saw firsthand. She could be brusque, abrupt-to-the-point-of-rudeness, and mercilessly direct in asking something of a policymaker (in the early 1960s, President Kennedy would joke to Bobby Kennedy, "Let's give Eunice whatever she wants so I can get her off the phone and get on with the business of the government"). And then five minutes later she could be warm and encouraging in her interaction with a Special Olympics athlete with Downs Syndrome. She could also be savagely funny, and she exuded a youthful vigor that belied her age and frailty. I watched her, in her early eighties, engage in mad dance parties with her young grandchildren-once she grabbed me and made me join in. She possessed the fierce Kennedy competitiveness and love of intramural family skirmishing. One of the most indelible images from the summer of 1997 was a relay race of Kennedys on the lawn at Hyannisport. There were two teams consisting of several grandkids, ages ranging from around two to seven, one team anchored by Eunice and the other by her brother Ted Kennedy. As the baton was passed to the anchors, Senator Kennedy, then in his sixties, had a lead of several yards. Eunice, then in her late seventies, sprinted past him to cross the finish line. As she did, she looked back and yelled, "Hurry up, fatso!" She had so much energy-physical energy, intellectual energy, nervous energy. In the book I wrote that "she is so full of nervous energy that even in repose she seems to give off an audible whir, like an overheating computer or household appliance." She channeled almost all of that energy-sometimes ruthlessly-into good works. The more I learned about her, the more of an honor it felt to have been traumatized by her relentless perfectionism. Her husband, her kids, her brothers-all of them had at one time or another been terrorized, and improved, by her. One day in the mid-1960s, Bobby Kennedy was scheduled to spend a day taping television advertisements with Democratic Senators and Congressmen running for re-election. He had taped spots with a few of the Congressmen, but had many more still to do when an aide reported that Eunice wanted to meet with him, and was calling repeatedly. Bobby started packing up to go. The aide was aghast-was Bobby really going to blow off a passel of Congressmen? "Look," Bobby said, "Who do you think it's worse to keep waiting: a bunch of Congressmen? Or my sister?" She could be difficult, and she could be fearsome; though I grew fond of her, and she stopped actively making my life miserable, she never stopped terrifying me. She was, quite simply, the most formidable woman I have ever met. Her legacy is profound and inspiring.